Investigators raided homes of Ratko Mladic's family in Belgrade, Serbia, and Radovan Karadzic's family in Pale, Bosnia-Herzegovina. PHOTO: Police vehicle is seen in front of family apartments of the most wanted war crimes suspect Ratko Mladic in Belgrade December 4, 2008. Police searched several locations across Serbia on Thursday looking for former Bosnian Serb war-time general Mladic, a source in the war crimes prosecutor's office said. 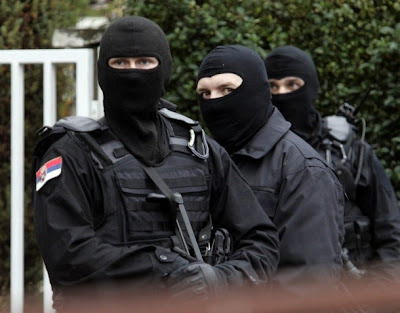 The elite anti-terrorist unit with masked policemen, wearing bulletproof vests and carrying machine guns, searched the home of Ratko Mladic's son, Darko, in the Belgrade suburb of Banovo Brdo, as well as four other sites in the capital last Thursday in an intensified hunt for the fugitive Srebrenica genocide orchestrator. Serbian authorities believe that Darko Mladic, wealthy businessman in Serbia, is his father's chief financier. The goal of the searches was to uncover people linked to the Mladic support network and cut off their sources of funding. According to Beta agency, Rasim Ljajic - president of the National Council on Cooperation with the Hague Tribunal - stated that the action in Belgrade was not to arrest Ratko Mladic, but to search for clues and evidence which could lead to his arrest. Serbian Interior Minister Ivica Dacic stated that no information was found that could confirm whether Mladic and Hadzic are in Serbia. However, Reuters reported that "the raid ended after about seven hours, with police impounding numerous documents, trophy arms and clothes they believe belong to Mladic, according to Dragan Todorovic, a nationalist Radical Party leader who was present as a witness during the search." 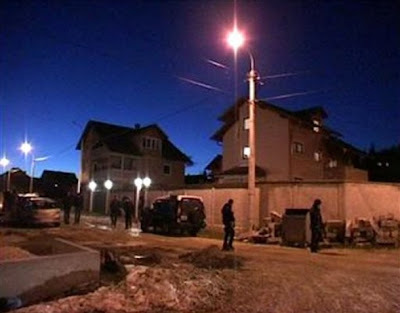 PHOTO: Members of Serbian anti-terrorist unit secure area around family apartments of the most wanted war crimes suspect Ratko Mladic in Belgrade on December 4, 2008. The former Bosnian Serb general is charged with genocide by the U.N. war crimes tribunal in the Hague, Netherlands, for orchestrating the 1995 Srebrenica genocide - the worst carnage in Europe since World War II. He is also charged for the armed siege of the Bosnian capital, Sarajevo - the longest siege in the history of modern warfare conducted by the Serb forces of self-proclaimed Republika Srpska and Yugoslav People's Army (later transformed to the Army of Serbia and Montenegro), lasting from April 5, 1992 to February 29, 1996. Srebrenica genocide claimed lives between 8,000 and 10,000 Bosniaks Muslims, including forcible deportations (ethnic cleansing) of 20,000 to 30,000 civilians. The siege of Sarajevo claimed lives of at least 10,000 civilians including more than 1,500 children. In a sickening show of 'reassurance' Bosnian Serb commander-in-chief General Ratko Mladic -- now on the war crimes tribunal's most wanted list -- told the women everyone would be taken out by bus out and safely reunited. When the cameras were turned off the real face of the Serb army emerged as the slaughter began. More than 60 truckloads of refugees were taken from Srebrenica to execution sites where they were bound, blindfolded, and shot with automatic rifles. Some of the executions were carried out at night under arc lights. Industrial bulldozers then pushed the bodies into mass graves. Some were buried alive, a French policeman who collected evidence from Bosnian Muslims, Jean-Rene Ruez, told The Hague tribunal in 1996. He gave evidence that Bosnian Serb forces had killed and tortured refugees at will. Streets were littered with corpses, he said, and rivers were red with blood. Many people committed suicide to avoid having their noses, lips and ears chopped off, he said. Among other lurid accounts of mass murder, Ruez cited cases of adults being forced to kill their children or watching as soldiers ended the young lives. "One soldier approached a woman in the middle of a crowd," he said. "Her child was crying. The soldier asked why the child was crying and she explained that he was hungry. The soldier made a comment like, 'He won't be hungry anymore.' He slit the child's throat in front of everybody." 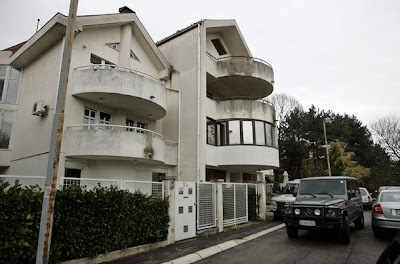 NATO troops also searched Radovan Karadzic's family home at Pale, near Sarajevo, for evidence of contacts to the network that has helped genocide suspect Ratko Mladic evade arrest. Karadzic's wife Ljiljana Zelen-Karadzic and his daughter Sonja Karadzic were among those at home, and they were questioned; however, their credibility is questionable. PHOTO: In this video image NATO peacekeepers in Bosnia secure the area outside the home, right, of Radovan Karadzic's wife, Ljiljana, during a raid and interview with family members over suspected links with war crimes fugitive Ratko Mladic, in Pale, some 20 kilometers east of Sarajevo on Tuesday, Dec. 2, 2008. NATO troops searched Radovan Karadzic's family home Tuesday for evidence of contacts to the network that has helped genocide suspect Ratko Mladic evade arrest. Karadzic and his former general Mladic are accused of having masterminded the 1995 Srebrenica genocide and the armed siege of Sarajevo during the 1992-95 war. Before his arrest, Srebrenica genocide architect Radovan Karadzic freely traveled and regularly stayed in touch with his family, including his wife, daughter, brother Luka and nephew Dragan. During that time, his wife deliberately mislead investigators, on numerous occasions, claiming that she knew nothing about Karadzic's whereabouts. She was known by putting up fake tears for the media (see photo) and pretending to be innocent victim who never knew where her husband was hiding, and denied any connection even when NATO troops found letters from Belgrade with Radovan Karadzic's fake name - Dragan David Dabic - while he was on the run. Unfortunately, Serbia refused to prosecute members of Karadzic's family, and the war crimes court in Belgrade never responded to our e-mails demanding the prosecution of these criminals, some of who publicly admitted their involvement in directly helping Karadzic evade justice. In July, Serbia arrested Bosnian Serb wartime leader Radovan Karadzic, also charged with genocide, and handed him over to the United Nations' International Criminal Tribunal for the Former Yugoslavia at the Hague. Click here to see photo of visibly shaken Karadzic facing justice in tears.